To mark would have been the 60th birthday of Keith Haring (1958–1990), the Albertina is devoting a comprehensive retrospective to this artist that includes around 100 works from international museums and private collections. Haring was one of his era’s widely celebrated artists. His works were shown at Documenta 7 in 1982, in leading international museums and galleries, and at numerous biennial exhibitions all over the world. Despite his early and lasting success among critics and on the art market, one central aspect—which can be viewed as a primary concern of his art—has to this day hardly been recognized in its true significance: his systematic symbolic language, which runs through all of his work like a golden thread. Keith Haring’s drawings, paintings, and sculptures embody messages that take a stand against the violence of ruling elites, against the oppression of minorities, against prejudice, and against barbarism. His themes thus repeatedly revolve around justice and change. Haring’s art consisted in a language that should be easily understood by every human being in its referencing of the creative principles of graffiti and street art, and with his stick-figures (themselves embodying a graphic form with prehistoric roots), he was part of that transformational process from low to high art that had already seen Pop Art cartoons and wall paintings added to museum collections. Haring championed the individual and opposed the oppression of individuals by dictatorship, racism, capitalism, and drug addiction. He fought to end Apartheid in South Africa, and his dedication to the fight against AIDS is legendary. He was also one of those voices that warned loudest about the perils of nuclear war, environmental destruction, and countless other threats to humanity and our planet. Keith Haring developed his entire symbolic language based on the realization that images can function like words, and his early subway drawings became a significant foundation of his art. 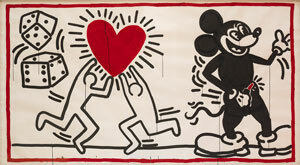 Haring’s influence on his contemporaries and on subsequent generations of artists has been enormous and lasting. And his political messages and thoughts are not only part of his legacy, but also part of humanity and the history of art as a whole. Catalogue Keith Haring, The Alphabet Editor : Dr. Klaus Albrecht Schröder and DDr.